For 2013, Kentucky scored a 1.30 on the FRASE index. By design, the FRASE index for the United States overall in any year will equal 1, so a score of 1.30 indicates that the impact of federal regulation on Kentucky’s industries was about 30 percent higher than the impact on the nation overall. While there is some fluctuation from year to year in the ratio of the impact of federal regulation on the state to its impact on the nation, more dramatic growth occurs in the total number of such regulatory restrictions affecting the state since 1997. One way to measure this impact is to scale the weighted restrictions to the total weighted restrictions for the national economy in 1997. Doing so allows us to calculate the growth of the FRASE index relative to 1997. For Kentucky, the FRASE index, scaled by total weighted restrictions for 1997, has grown by 43 percent from 1997 to 2013. 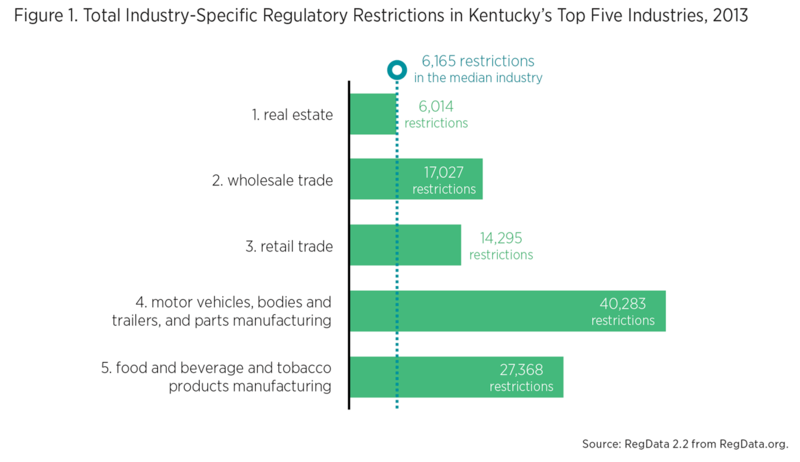 So why is the impact of federal regulation higher for Kentucky than for the country overall? The answer lies in the particular industries that make up the state’s economy and how regulated those industries are. The quantities of regulatory restrictions affecting the top five industries by contribution to Kentucky’s private sector are shown in figure 1, and the contributions of those industries to the state and national private sector are compared in figure 2. While the motor vehicles, bodies and trailers, and parts manufacturing industry is only the fourth- largest industry in Kentucky, it contributes the most to the state’s FRASE score. 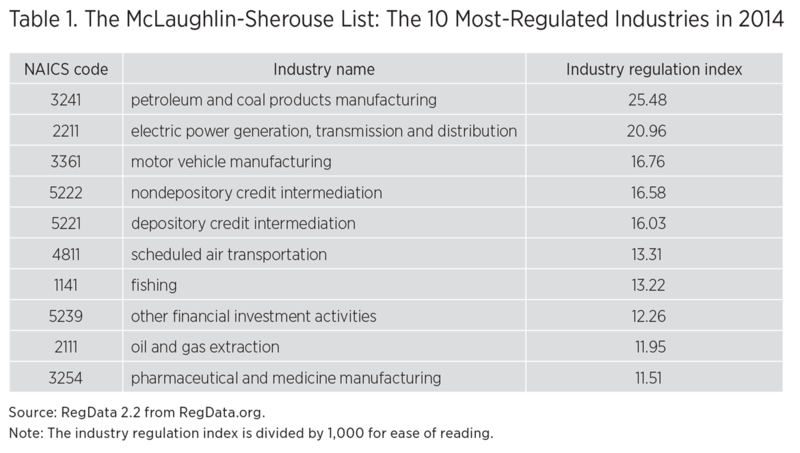 First, the industry is highly regulated, subject to more than 40,000 industry-relevant restrictions. 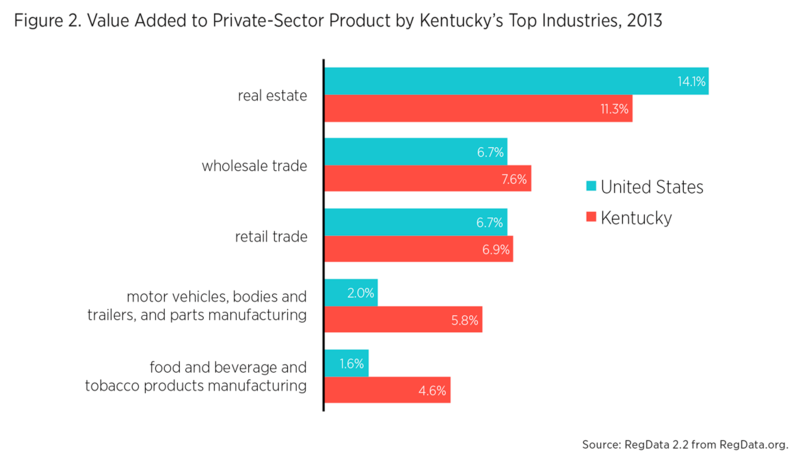 Second, the industry is almost three times as important to Kentucky as to the country overall, contributing up to 5.8 percent of the state’s private sector as opposed to 2.0 percent of the nation’s. 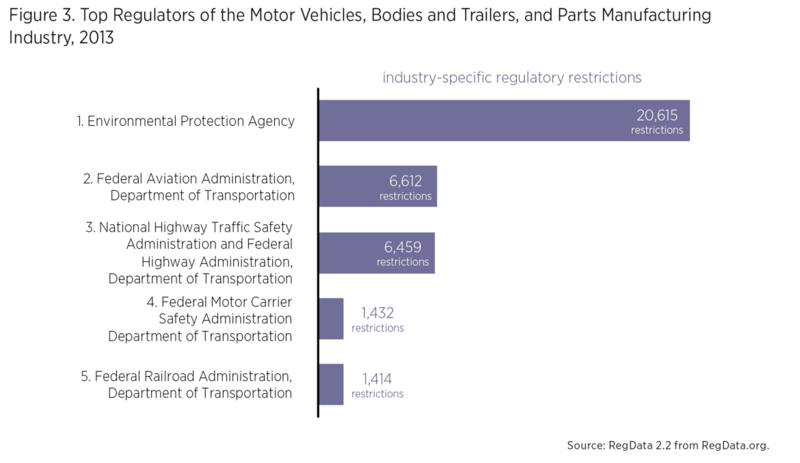 Figure 3 shows the top five regulators of the motor vehicles, bodies and trailers, and parts manufacturing industry. The top regulator is the Environmental Protection Agency, which accounts for more than 20,000 restrictions. The other top agencies are, in descending order, the Federal Aviation Administration, a combination of the National Highway Traffic Safety Administration and the Federal Highway Administration, the Federal Motor Carrier Safety Administration, and the Federal Railroad Administration. Unsurprisingly, these regulators comprise a mix of environmental and transportation-focused agencies.